I received the magic call today to schedule an interview for a middle school math position. The interview isn't until next Thursday, so I have a week to prepare. My cooperating teacher suggested that I prepare a portfolio of activities, lesson plans, etc that I am proud of to take with me to the interview. So, I'll be working on putting this together over the next few days. My first cooperating teacher at the high school level shared with me this method of teaching slope. After introducing what slope was, we asked the students to draw a tree in their notes. However, they couldn't draw just any tree. Instead, they would learn how to draw a special kind of tree. After drawing the above tree on the board without the labels, the students commenced to criticize the tree and say how it looked more like an arrow than a tree. Luckily, it really doesn't bother me when students criticize my drawings. I'll be honest. I am no artist. And, obviously, I have a lot of trouble drawing straight lines. Because the trunk of my tree above actually has a very slight positive slope instead of the intended undefined slope. We then proceeded to talk about the different kinds of slopes that could exist. As we discussed the different slopes, the students labeled their tree. 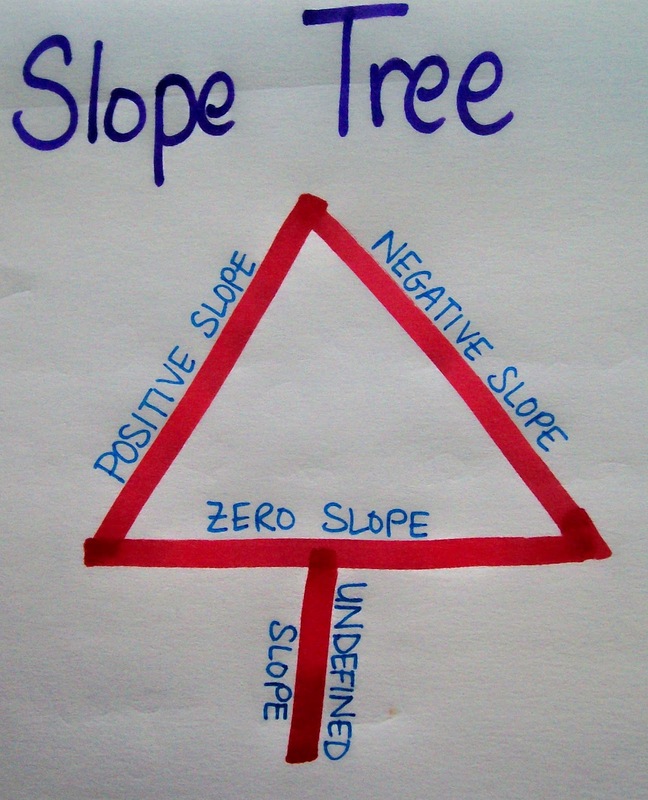 Though the students thought it silly, there was something about this tree that made the concept of slope really stick with my students. I can't tell you how many times over the next month that we continued to reference this tree. I would be working with a student, and I would ask them whether a graph had a positive or negative slope. When they said they didn't know, I would then ask, "Which side of the Christmas Tree does the graph look like?" As soon as I asked this, they would almost instantly be able to determine if the slope was positive or negative. You may have noticed this slope tree under one of the flaps I posted of my Slope Foldable*. I thought it deserved a post of its own. This isn't the only way to teach students to remember the different types of slope, though. Here are links to some other ideas that I have seen around the blogosphere lately. Math Hombre featured Mr. Slope Guy recently on his blog. I Want to Teach Forever shared an Alphabet Slope Activity. If you know of any other creative ways of teaching slope, I'd love to hear them in the comments! * Fair Warning: If you remind students to draw the Christmas Tree on their foldable to help them remember the different types of slope, one student may draw an actual Christmas tree, complete with ornaments, but lacking any mention of types of slope. Weeks later, when you mention that they should look at the Christmas tree on their foldable, they will proceed to show you the Christmas tree they drew and ask how that will help them with their current math problem. As I type this post, I am laying in bed, eating popcorn, and staring at the piles of boxes that have began to surround me. My Smart Board file for tomorrow is done. Worksheets are ready and printed. It's the last day of Spring Break. In fact, this week marks my last Spring Break as a college student. My cap and gown are hanging in my closet. Graduation is quickly approaching. And, I have to be moved out of my apartment by the day after graduation, so the packing has began, hence the boxes. My cooperating teacher suggested that I try to make my Spring Break as relaxing and fun as possible since student teaching can be an overwhelming and exhausting time. I'm not sure if my activities will meet his approval, but I can say that my spring break has been most productive. I fit in a dentist appointment, doctors appointment, and I got my taxes sent off. I wrote my next-to-last essay for my student teaching seminar class. However, I'm most proud of the applications I submitted to thirty different school districts. 28 paper application packets and 2 online applications. This brings my total to 32 school districts applied to. The process of filling out all of these applications and answering the essay questions for many of them has led me to feel much more prepared for the interview process. I'm both excited and terrified for the changes that the next few months are going to bring. I am most anxious to find out where I will be teaching and what I will be teaching. I'm ready to start making plans of how I'm going to organize my classroom. I want to start planning units and activities. During my high school placement, I did a lot of observation and a little teaching. The majority of my day was spent working one-on-one with students. I loved it, and I really learned a lot. Now, the first two weeks of my middle school placement were similar. I observed the new teacher's style, discipline procedures, routines, etc. Whenever students were working, I was circulating the classroom, helping students and answering questions. This week marks the beginning of the actual teaching period of my student teaching. I am fully in charge of lesson planning, grading, teaching, and everything else that goes with being a teacher. I'll admit that the transition has been slightly overwhelming. This is the first time that I have been able to choose what is taught and how it will be taught. But, I am so thankful for this opportunity because I believe it truly reflects, to the greatest extent possible, what being a teacher is actually like. With only three full days of teaching, I feel like I have already learned a ton. Do not let middle school students choose their own groups. Groups, to be effective, need to be carefully selected. Always have an activity planned for students who finish early. I had not incorporated this into my lesson plans for the week, but that has been changed. Students know, now, that if they finish the activity early they are to create a problem of their own related to the day's lesson. For example, my students have really been struggling with proportion problems. Since we've been practicing proportion problems this week, I had students who finished early today create problems of their own that can be solved using proportions. An organizational system is crucial. In just a few days of teaching, I have become overwhelmed by paper. I've kind of made up a system as I've gone, and while it has worked it has not been the best. I need to start thinking about how I am going to keep organized when I have a classroom of my own. Everyday, my cooperating teacher takes a ton of notes as I teach first period. It works out nice since we have second period plan. So, after first hour, we sit down and talk about how first period went. The feedback he has been giving me is most helpful. It's nice because he writes down both what worked well and what needs some work. Instead of feeling criticized, I often end up feeling encouraged. Because after I finish teaching a lesson, I am usually only focusing on those things that I wish I had done differently or better. So, it is reassuring to hear that, for the most part, the lesson went well. One thing I've been working on since Monday is rephrasing my questions. My first instinct is to say, “Mary, how do we find circumference?” I never really thought much of this until my cooperating teacher suggested that I change the order. Instead, I should say, “How do we find the circumference, Mary?” Though it sounds weird to me, I do see the reasoning behind his suggestion. When I preface a question with the name of who it is intended for, many of the students may tune out the question or not attempt to answer on their own since they know they will not be called on. However, if I ask a question without yet specifying the name, all of the students should be thinking about an answer to the question until I specify who I am calling on. I've found that this is a hard habit to break. Often, during the week, I've already said a student's name before I remember that I need to place the question first and the name last. When I met with my cooperating teacher at the beginning of February, he told me that I would be observing for two weeks before taking over the 5 sections of Pre-Algebra. Two weeks, at that time, seemed like a sufficient amount of time to get accustomed to a new classroom and new students. My first week of middle school, however, has come and gone. I'm learning the importance of setting clear expectations, of ensuring that the students always have something that they should be doing. I'm overwhelmed with names. First names. Last names. Nicknames. One week from now, I am, essentially, going to be the teacher. And, I'm terrified. As I set down this weekend to start planning, I realized how much I don't know. My degree is in mathematics, so I know the content. But, I don't know how much material can be covered in one class period. Should I assign homework? If so, how much? And, what exactly does it look like to review for a state test? If I had been given a topic to teach, I feel like I would be able to design a lesson to teach that topic. But, I have no single topic to teach. Instead, I have the entire 8th grade math curriculum to review in a matter of weeks. Next week, the students will take two practice tests. So, I will be able to use the results from these practice tests to determine which areas I need to focus my review on. I have a stack of test review resources to help. And, my cooperating teacher has asked that I incorporate a set of 11 videos of test-taking strategies into my lesson plans. The videos were made by middle school math teachers in California. The students have already seen these videos earlier in the year, but they need to review them before taking the state test in April. As of right now, my plan is to find sample test questions that each strategy can be used on. Then, each day, students will watch one video. After the video, they will be able to instantly apply what they have learned from the video to a set of sample test questions. I'm hoping that after several conversations with my cooperating teacher everything will fall into place. In my cover letter, I have written that I believe that learning happens by doing, by trying, by making mistakes. And, I know that the same is true for learning how to be an effective teacher. After trying a certain technique or way of structuring a lesson, I will learn what works best. Not every lesson will be a complete success. But, I can learn something from every lesson that I teach. Reality has set in. Two months from tomorrow, I will be walking across the stage to receive my diploma. I need to learn everything that I can in the next seven weeks to prepare me to assume my own classroom come August.